Why be dull when it’s so easy to shine? 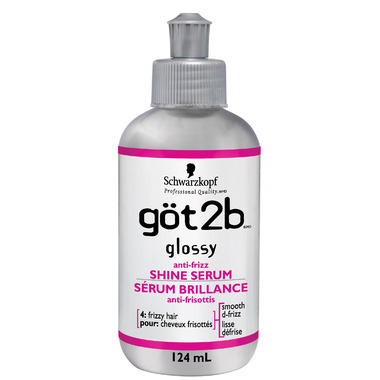 Add brilliant shine, beat the frizzies and control flyaways with an alcohol free serum loaded with conditioning agents. Formulated with a UV absorber, glossy provides normal, dry, coarse or chemically treated hair with a high gloss, super sheen. Directions: On wet hair, apply a small amount to palms of hands and work through hair from roots to ends. To control flyaways on dry hair, apply a small amount to fingertips and work through hair, concentrating on the ends. It's the only product that works well on my thick, fuzzy, damaged hair. Only partially grey but my straight hair has gotten very frizzy over the years. Smooth, soft and shinier. My greying hair around my face was getting very frizzy but this did an amazing job of taming it! Great product but agree that it is very hard to get off your hands after applying it to your hair. Will keep using it for the good it does. Really love this product. Makes my hair super shiny and feel healthy. The only thing is that it does leave an oily film on your hands and I find I have to wash my hands really well after applying it. I'm probably using too much but my curls just soak it right up. Super duper!! AMAZING! All this time, I thought my curls always became unruly or less defined because of bad mousses, but nope it was because it didn't have this product! First time using it and my curls are so defined and so shiny and ugh LOVE IT! Oh, I love this stuff. Buy it over and over again (: So happy I started using this. It really does take the frizzies out of my hair and it makes it shiny in a way. (: Love it, my favourite Product. Why is it every time you find something you REALLY LIKE, it gets discontinued!! After trying so many different products, this was the only one that truly worked for me!! Just a small amount and my hair always blew dry smooth and shiny. I hear the replacement just isn't the same. I just love this product!! It really does what it says and my hair looks great when I use it.